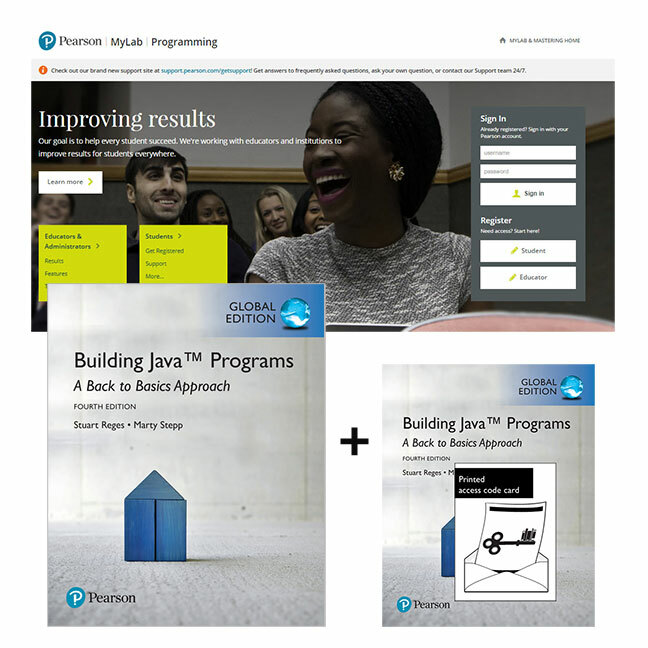 This pack contains 1 copy of Building Java Programs: A Back to Basics Approach Global Edition + 1 printed access card to MyLab Programming with eText. Newly revised and updated, this Fourth Edition of Building Java Programs: A Back to Basics Approach uses a layered strategy to introduce Java programming and overcome the high failure rates that are common in introductory computer science courses. The authors’ proven and class-tested “back to basics” approach introduces programming fundamentals first, with new syntax and concepts added over multiple chapters. Object-oriented programming is discussed only once students have developed a basic understanding of Java programming. Previous editions have established the text’s reputation as an excellent choice for two-course sequences in introductory computer science, and new material in the Fourth Edition incorporates concepts related to Java 8, functional programming, and image manipulation. MyLab Programming is an online learning system designed to engage students and improve results. MyLab Programming consists of a set of programming exercises correlated to specific Pearson CS1/Intro to Programming textbooks. Through practice exercises and immediate, personalised feedback, MyLab Programming improves the programming competence of beginning students who often struggle with the basic concepts of programming languages. MyLab Programming is not a self-paced technology and should only be purchased when required by an instructor. The duration of access to MyLab Programming is set by your instructor for your specific unit of study.